my new sculpture that's in the works. Top tier is mash, middle tier is boil, and bottom is HLT. Still debating on if i should get a burner for the top tier or if i should just recirc it through a copper coil that will be placed in the HLT. first time brewing on my new system a few weeks ago... overall i'm very happy with my build. My buddy and I used stuff around both our garages to build this. All i needed to buy was a stainless steel pump and a few fittings. Everything else i already had. And I just scored a JZ 50' chiller for $20 and a case of beer. 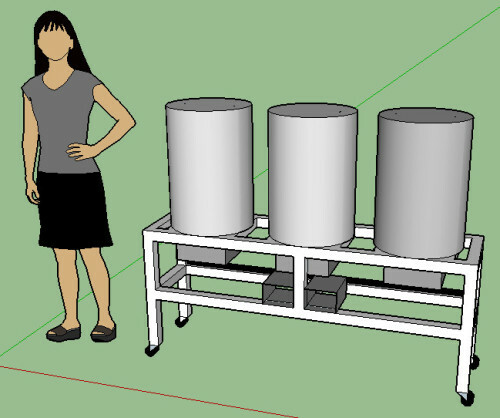 I have been messing around in google sketchup and designed a brew stand. Nothing special just a brutus 10. I'm going to make it a little taller because right now the pumps are about 1 foot off the ground and I want them a little higher up. I'm 6-4 so having the pump all the way down there is pretty low. I'm in the process of looking for a house and a shed is high up on the list of wants so this will be in the shed when I get it. mattman688 wrote: my new sculpture that's in the works. Top tier is mash, middle tier is boil, and bottom is HLT. Still debating on if i should get a burner for the top tier or if i should just recirc it through a copper coil that will be placed in the HLT. yeah i will measure them when i get home. I designed it to handle a larger setup in the future if i decide to buy larger kettles. If i recall. the bottom tier base starts at 12" high, then i measured the height of a keg and added 18" for the top tier i believe. Then the second tier is 12" above the bottom tier. I think each section is 24" wide. Thats a strong guess, i'll measure when i get home. Thanks, it's a nice looking system. Any measurements? I am anxious to get started.